Tigest Sendaba is a human rights advocate and professional with experience in the national, regional and international fields. Tigest recently worked as a Human Rights Officer with the Office of the High Commissioner for Human Rights (OHCHR) Regional Office for the Pacific based in Suva, Fiji. The office works to promote human rights principles, instruments and practice across 16 Pacific Island countries including Australia and New Zealand. Tigest provided technical assistance in promoting human rights, responding to emerging issues, meaningful engagement in the Universal Periodic Review and advocating for increased ratification and effective implementation of international human rights conventions and declarations. Prior to that position, Tigest worked for the Secretariat of the Pacific Community’s Regional Rights Resource Team (SPC/RRRT) as a Human Rights Policy Development Mentor. 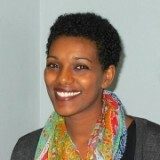 Tigest’s work at RRRT focused primarily on violence against women and rights of persons with a disability. Tigest also has extensive experience with implementing human rights standards (policy, procedure, training and education) in law enforcement through her work in Australia with Victoria Police and ACT Corrective Services. Prior to that Tigest also worked in research and policy relating to Indigenous Affairs with the Australian Federal Government. Tigest holds a Masters in International Relations from the University of Melbourne, Honors in Sociology – with a thesis on social movements and political activism – and a Bachelor of Arts both from the Australian National University.